The Group meets on the first Friday of the month, except January. At the meeting, an informative topic will be presented by a guest speaker, a plant table will display native flowers grown by members and native plants for sale. Visitors are most welcome to attend our meeting. Further information can be obtained by contacting our secretary. Would you like to learn more about the Goodeniaceae family and you missed the FJC Rogers Goodeniaceae Seminar last year? Then come to our May Monthly Meeting. David Lightfoot is our Guest Speaker and he will give presentation of this interesting plant family. For information on upcoming events (District Group Plant Sale, Seminar and other events), this link will take you to Event Calendar in APS-Victoria Web site. Hover over the picture for more information. A dense, rounded shrub (H 1.5m, W 2m) with narrow, dark green, prickly leaves and red and cream flowers in winter and spring. The Lara dwarf form, now extinct in the wild, has grey-green leaves and a slow-growing, compact, growth habit to 60cm X 60cm. 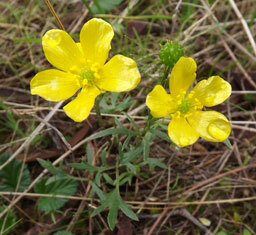 Occurs naturally in stony knoll grasslands and escarpment shrublands. Very useful for attracting honeyeaters. A hardy shrub for most well-drained soils in full sun or semi-shade. Both forms will hybridise readily with other forms in cultivation. Lovely herbaceous plant (H 40cm, W 20cm) with rich, green lobed leaves and masses of shiny, bright yellow flowers in spring. It prefers soils that hold a bit of moisture although it withstands periods of dryness with occasional applications of water. Best grown in a semi-shaded to full sun position. Suitable for growing in containers. (H 1m, W 40cm-1m) Narrow, stiff, dark green strap-like leaves; flower stems almost identical to leaves but with flowerheads towards the ends. 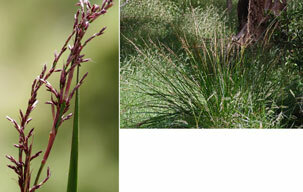 A very hardy, ornamental sedge, preferring moist, well-drained soil in full sun or semi-shade. Ideal for planting under eucalypts. Variable form, ranging from rounded tussock in moist shade to a few leaves in dry conditions. Difficult to propagate, so it is not often seen in nurseries. Often occurs near riparian zones on the plains. 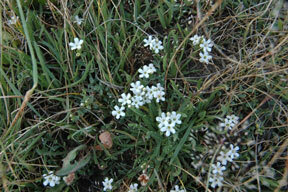 A dense, vigorous groundcover (H 10cm W 1m) with masses of white flowers in spring and summer. Autumn fruit eaten by rosellas. Very hardy and suitable for most well- drained soils. Suitable for embankments and retaining walls. Several non-local forms are common in nurseries. Locally extinct in the Melbourne area. Come and join us to learn and share the knowledge of the local indigenous flora of Keilor Plains and Australian Flora in general. More information can be found in Membership Info page. Organized trips to Native flora reserves and garden. A day trip on Saturday every second month. A week-end trip to visit an area in Victoria in Spring (September or October). A four-day trip to the Alpine areas in Summer (end of January) every second year. Quarterly Newsletter and APS Victoria "Growing Australian" magazine. Native flora for sale at the monthly meeting. Access to APS Victoria Book Sale. Optional subscription to ANPSA "Australian Plants" magazine. 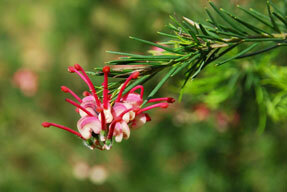 We are one of the district groups of Australian Plants Society Victoria (APSVIC), which is a Member Society of Australian Native Plants Society (Australia) (ANPSA). Our members live in the Western Plains of Melbourne and surrounding area. For more information about the group, go to About Us page. We can also be found in Facebook and Instagram. NatureShare is an information sharing website which collects observations of remnant and self-sustaining flora/fauna in Victoria (but not plants in revegetation areas, garden plants or pets). We are one of the groups that supported the creation of this website, and our members regularly contribute to its observation database. A list of useful informations in ANPSA Plant Guides pages. - Small Eucalypts for the Garden. 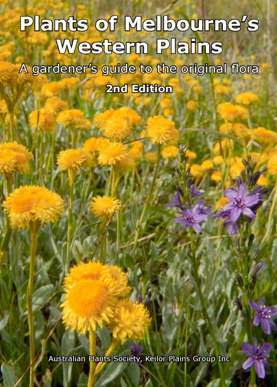 Other useful links, such as local nurseries, flora and fauna information, can be found here. Copyright©2019 APS Keilor Plains Inc.